Today we have brought Old Hindi Movies 1950, 1950 Bollywood Movies List, Bollywood Movies 1950, 1950 Hindi Movies List from the 1950s bollywood. It was that decade after India’s independence,When India was moving towards its new era.And most of the movies were made on the situation of that time and on society. When we are talking about Old Hindi Movies 1950 the big artists of that year included names like Ashok Kumar, Bharat Bhushan,Dilip Kumar,Raj Kapoor,Dev Anand etc. This was the highest grossing movie of that year. The movie had earned 1,35,00000 rupees. Ashok Kumar and Nalini Jaywant appeared in lead role. 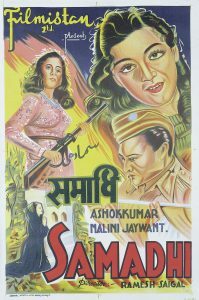 This movie was directed by Ramesh Saigal and music was composed by C. Ramchandra. It was a detective film. Its story was based on freedom fighter Subhash Chandra Bose. This movie was a love triangle and proved to be a great success on box office. Dilip Kumar played the postmaster in the film. 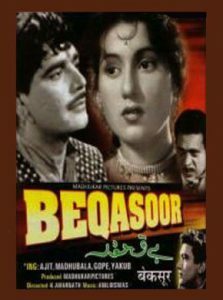 Nargis appeared in the role of poor girl “Bela” in the film. This film was produced by musician Naushad. Actor Ashok Kumar first time appeared in negative role in this movie. Shashi Kapoor played Ashok Kumar’s childhood character in the film. It became the sixth highest grossing movie of that year. The film had earned Rs. 1,15,00,000 that year. Raj Kapoor, Suraiya and Veena appeared in the lead role in this film. Movie Directed by Abdul Rashid Kardar and the music was composed by Naushad. Suraiya’s performance was so awesome it really overshadowed all the other actors including Raj Kapoor. 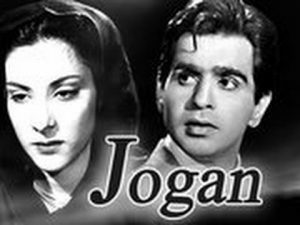 The list of Bollywood Old Hindi Movies 1950 will be incomplete without this romantic classic film Jogan. 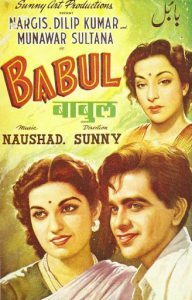 Nargis and Dilip Kumar played an important role in this movie. It was a major hit on box office and became the fourth highest earning film of 1950. Rajendra Kumar appeared in supporting role. 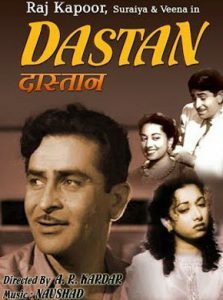 It was the seventh highest earning bollywood movie in year 1950. It collected Rs. 90,00,000 at that time. Madhubala and Ajit played leading roles in this movie. Movie directed by K. Amarnath and written by Madhusudan. Thank You for reading article on Old Hindi Movies 1950 | 1950 Bollywood Movies List | Bollywood Movies 1950 | 1950 Hindi Movies List. Stay Tuned With Cinemaz World for more Bollywood Updates.